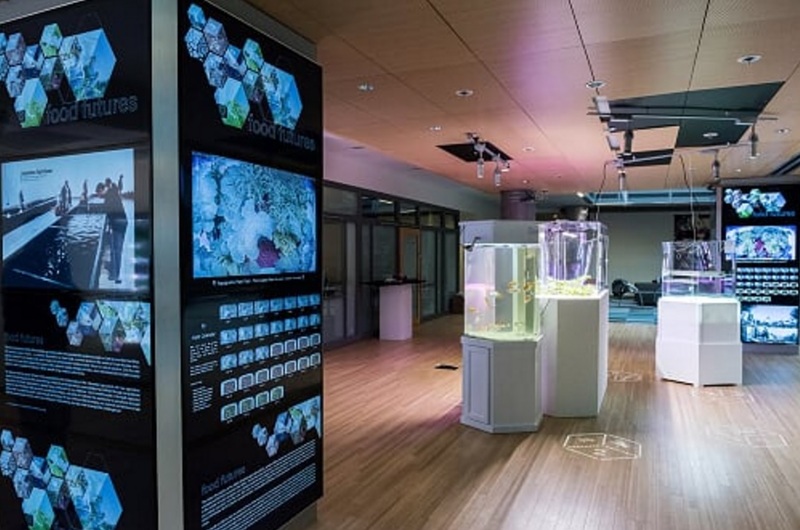 The last thing I expected to see when I visited Microsoft Research in Seattle last month were lettuces growing under LED lights and fish swimming in a tank as part of an “aquaponics” experiment. It turns out that the small crop installations are part of growing efforts underway at the software giant looking at the future of food. While Microsoft has leafy greens growing in cabinets all over its Redmond campus that are destined for restaurants that help feed 40,000 staff based there, its interest in food goes much further. 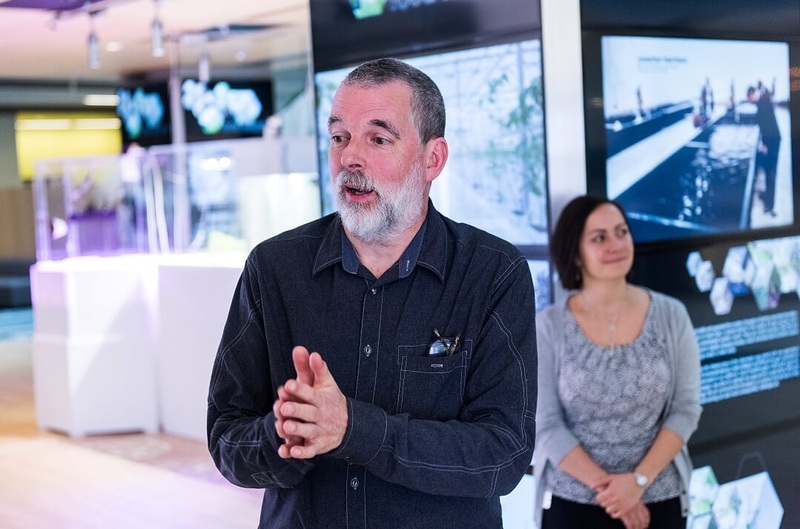 Paul Johns, senior research design engineer at Microsoft Research walked me through a series of sensor and camera-based technologies Microsoft has developed to monitor crop growth and yield for crops grown in-door under lights. A revolution in LED lighting has made it more affordable to grow crops indoors and nearer to where people live. Paul Johns explaining Microsoft’s research projects in smart farming. It is making vertical farming more viable and the future prospect of crops growing skyward rather than spreading out over land that is increasingly in demand for habitation – or to be preserved for ecological diversity. Microsoft sees major business potential in running all the data analytics for such farms, using internet-connected sensors to give farmers intelligence on their in-door crops – and managing it all using services like its Azure cloud computing platform. The aquaponics installation saw fish faeces collected for use in soil-free farming. Cameras monitor the motion of the fish to check on their health while sensors test water quality and ph. as well as oxygen and nitrogen levels. 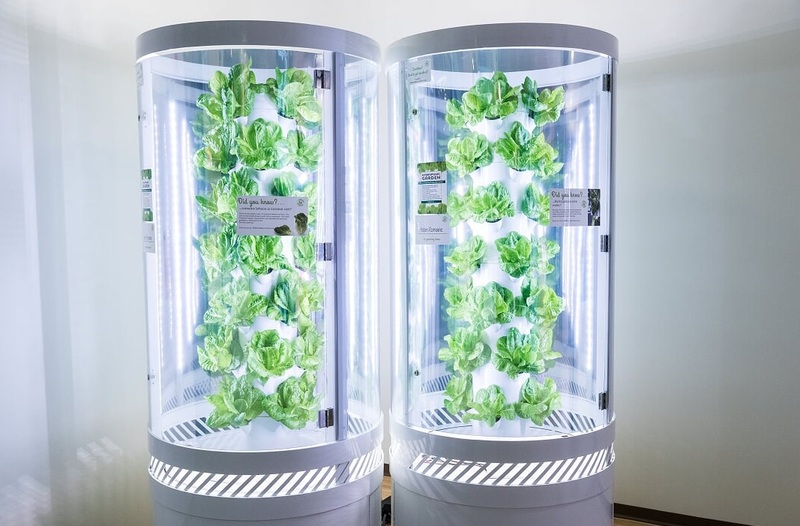 LED-lit pods like these grow leafy greens all over Microsoft’s campus for staff consumption. 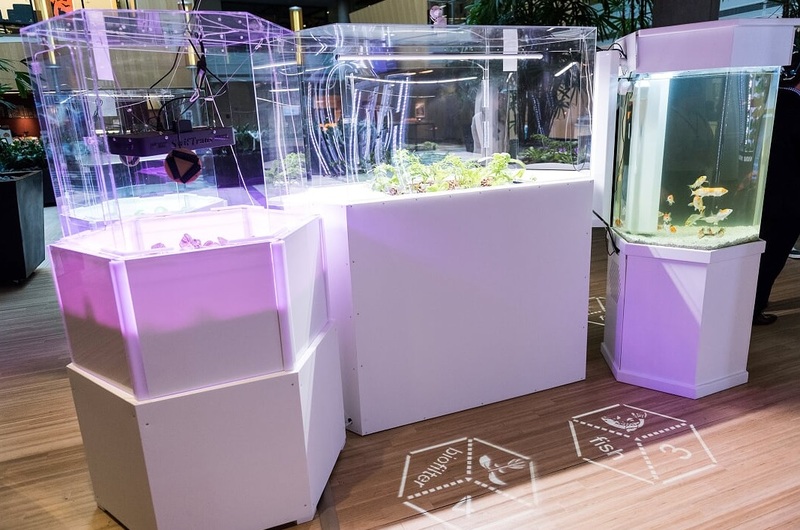 Sensors monitor the growth of a range of “micro-green” crops – and aquaponics. Outdoors, Microsoft is also developing an internet of things gateway for large farms and trying to overcome the lack of tech infrastructure associated with farms in doing so. The FarmBeats project is using solar-powered white space-based internet connectivity to record soil temperature and moisture levels and track them with cloud-based computing models. White space internet connectivity relies on unused broadcasting frequencies in the wireless spectrum, which have been opened up for use. In remote areas, where fixed wireless services aren’t operating, these types of wireless networks can cover farms allowing low-power sensors to send real-time data over large distances. A slightly more “out there” project at Microsoft Research is combining engineering and biology to see if we can communicate with plants. It started out as a highly-experimental art-science experiment, but Project Florence is now attracting a lot of attention among Microsoft’s researchers, according to research designer Asta Roseway, who gave me a demo of the technology. How does it work? Here’s a detailed explanation, but basically it involves a human typing a message to the plant into a computer. Asta Roseway showing off Project Florence. The message is then analysed for positive or negative sentiment using natural language processing. The detected sentiment of the message is then converted into light signals – a series of blinks that vary in colour depending on the sentiment of the message being conveyed. 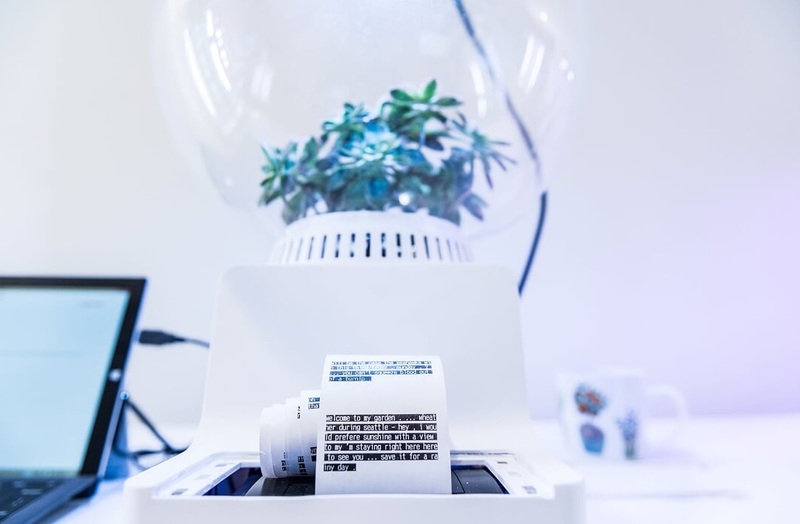 Sensors embedded in the leaves and roots of the plant then detect how the plant responds to this message with positive or negative sentiments and in the case of the art installation, converts those sentiments into tweets! 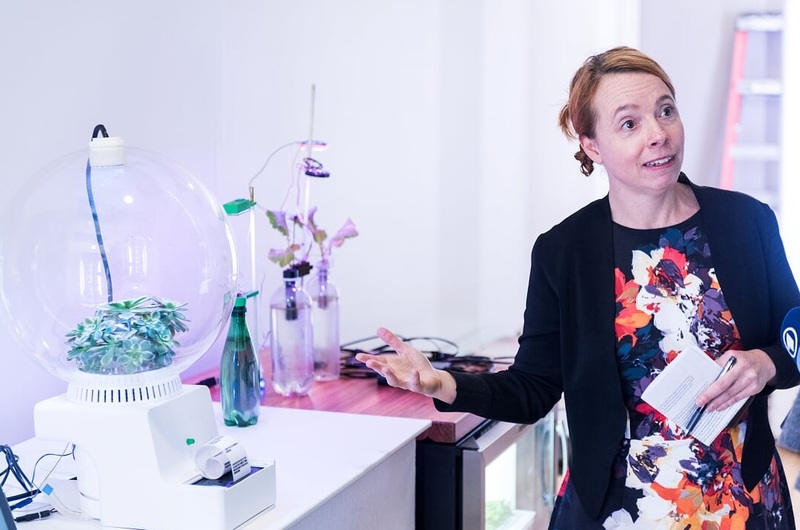 Rather than just a gimmicky effort to anthropomorphize plants, researchers see the technology as holding promise for detecting and understanding subtle changes in plant life in realtime to detect such things as stress or the onset of disease.